Size 2 Angry Birds one-piece rashsuit. This swimsuit is great for all Angry Birds fans. It is practical, colourful and provides great sun protection. ■ Angry Birds Swimsuits are available in 4 different designs. See the three alternative designs Angry Birds Swimsuit Design 1, Angry Birds Swimsuit Design 2 or Angry Birds Swimsuit Design 3. 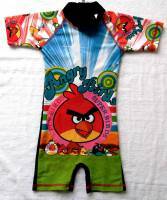 This Angry Birds Swimsuit is also available in Size 4, Size 6, Size 8, and Size 10.